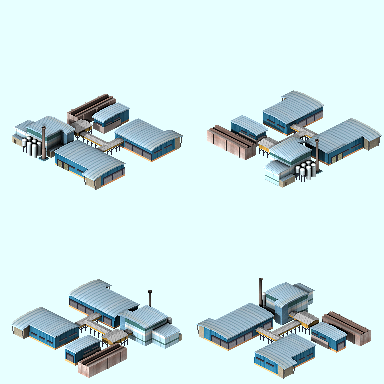 I was going to take part in a new extension pak focused on industries, but the project is halted yet, so I'm going you post here some advances. The pakset includes some green powerplants (wave power, geothermal, biomass and combined cicle) and some new chains (oilriggs, recycling chain, etc..) I hope I'm able to finish all I have in mind. The first preview is for the geothermal powerplant, that gets the energy from earth's heat to produce electricity. So any fusion power under green powerplants? It only appears in temperate,tundra,rocky and artic climates. I'm now working on a new bigger oil platform and some other surprises..
That's my idea. The original one seem to be taken from a photograph, and imho doesn't fit as well as it should, and it's very small too. The one I'm developing is based on Exxon Mobile Oil Platform in the North Sea, with the extraction tower separated from the processing plant. EDIT: Preview updated with the latest changes. WOW!! these oilrigs are terrific when can we see them incorporated into the game? When I finish them... .... I must add the piping system at the auxiliary platform, and apply the textures too. Not yet. I've some representation problems with the yellow structures (cranes, oil pump, towers) and I need to make some scale tests too. It's a complex project so you must be patient. It will be finished sooner o later..
Oww I like your addons! I downloaded all of it! These are the first scale tests of the north sea oil rig.. The oil drilling ship is finished. It produces 45 units of oil as much. The last test before the release of the new North Sea Oil rig.. I just need to add some extra lights and the flame at the top of the extraction tower.. This look very very neat! And also for that depot. Personally I find the glowing derrick a little strange. For an oil rig I would expect a dull color and not somethign glowing in the dark ... Other than that a very nice one. Colonyan is right. I just wanted to add some bright colors to such a dark building. In addition, I've planned another industry chain that will also have a rig, so I needed to distinguish one from the other and I though the color of the main structures was a good choice. Finally, here it is...the North Sea Oil rig.. it produces 200 units more than the current oil rig but it appears less frequently. I'm going to start a new industry chain called Recycling chain. These are the recycling points (aka green points), the first element of the chain, that will be within the cities producing waste. There should be at least one in every city. I'll try to create 4 or 5 different models. Then, the waste will be consumed by the biomass powerplant that will produce electricity, and the Recycling plant that will produce paper, plastic and steel in small amounts. But... what if the recycling plant comes first and then the printing press connects to the recycling plant, which isn't producing enough paper? Hmm... that could end up being complicated. However, in any case, I like the idea of recycling plants and collection points a lot, and I can't wait to see it in a pak(set). Good work on the image, too. Will the waste they produce be the same as the waste produced by scrapyards? Does a new recyclables good need to be created? 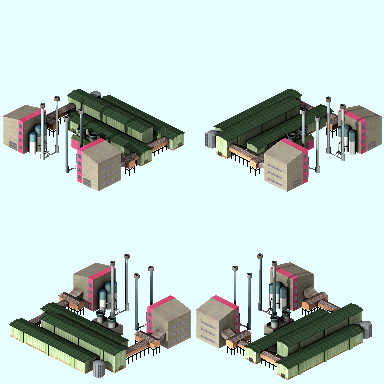 The idea is to have another element that produces paper when the paper mill is not available, but obviously the production level would be lower, more or less one tenth. 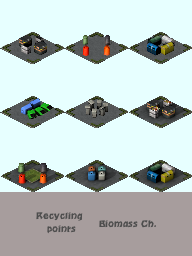 As the waste already exist as good in Simutrans, I prefer to use it. Creating a new good is a hard task mainly because you have to make the balancing of the whole industry chain, so I prefer to take advantage of what's already done and tested. It's a matter of laziness but on the other hand, it's my first complete industry chain, thus I don't want to make something very complex..
All of that is cool. The potential 'problems' I mentioned could also be considered not as 'problems' but as an optional 'challenge'. Some of us enjoy challenges in our games. Others of us don't. I think that the way you're planning this is a good thing. When setting the recovery amounts, different materials are more easily recoverable than others. However, on the subject of power generation, I think you can't eat your cake and have it, too. I'm no expert, but my understanding is that recycling that generates power does not generate reusable materials. E.g., if you use waste paper to generate power by incinerating it (by the by, does the incinerator generate power, or just consume waste? ), yu won't get recycled paper. So, you might want to think about that. It's my understanding that recycling anything requires a power input to go from waste => plastic/glass/aluminum/steel/paper. Now, if you're accepting as waste things that should go into compost, then yes, you can generate the power for it, but I don't know if you'll get any net production of electricity. Someone wit more knowledge in this area, please correct/confirm this. By the by, I think it would be cool if one of the recycling functions produced fertilizer, which would act on farms like electrification does on other industries. The chemical plants could also produce it. But that's a big project for another place and time. As you can see in the graphic above, the original design includes the idea of metane generated by the biomass powerplant, but I'll leave it aside by now. Waste consists of several elements, some of them are organic and go to the powerplant in order to produce energy, and others are inorganic so they go to the recycling plant. imho, It's the most realistic approach I can achieve without adding more complexity to the chain. Btw, the recycling points are almost finished too. 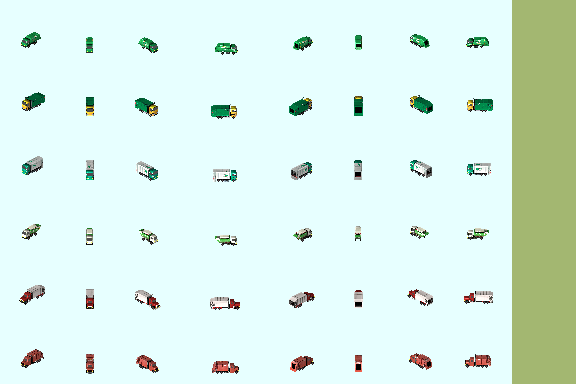 I only have to create the vehicles for transporting the waste, trucks and wagons. Wow!!! Vilvoh these are great, any chance of doing them for PAK128 as well?